Anesthesia is the term given to the loss of feeling or sensation. In medical terms, it is the method of decreasing sensitivity to pain in a patient so that a medical procedure may be performed. Anesthesia may be accomplished without the loss of consciousness, or with partial or total loss of consciousness. There are two kinds of anesthesia: general anesthesia, which affects the entire body and causes a loss of consciousness, and local anesthesia, in which only the area being operated on is affected. With local anesthesia, the patient may be conscious during the course of the operation or given a sedative, a drug that induces drowsiness or sleep. Anesthesiology is the branch of medicine dealing with anesthesia and anesthetics. Anesthetics can be administered by doctors (called anesthesiologists) or by specially trained nurses (called CRNAs, certified registered nurse anesthetists) working under a doctor's guidance. The development of modern anesthesia has made possible complex operations such as open heart surgery. Methods for lessening the sensation of pain during surgery date back to ancient times. Before the discovery of substances that produced general anesthesia, patients needing surgery for illness or injury had to rely on alcohol, opium (a natural narcotic derived from the opium poppy), or fumes from an anesthetic-soaked cloth to deaden the pain of the surgeon's knife. Often a group of men held the patient down during an operation in case the opium or alcohol wore off. Under these conditions, many patients died of shock from the pain of the operation itself. Nitrous oxide, ether, and chloroform. The gases nitrous oxide, ether, and chloroform were first used as anesthetics in the nineteenth century, ushering in the modern era of anesthesia. Nitrous oxide, or laughing gas, was discovered as an anesthetic by English chemist Humphry Davy (1791–1867) in 1799. Davy's finding was ignored until the next century, when Connecticut dentist Horace Wells (1815–1848) began to experiment using nitrous oxide as an anesthetic during tooth surgery. In 1845, he attempted to demonstrate its pain-blocking qualities to a public audience but was unsuccessful when he began to pull a tooth before the patient was fully anesthetized. The patient cried out in pain and, as a result, another 20 years passed before nitrous oxide was accepted for use as an anesthetic. 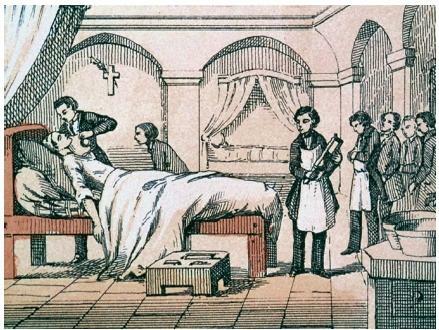 The first use of ether as an anesthetic during an operation was claimed by surgeon Crawford W. Long (1815–1878) of Georgia in 1842. The operation, however, was unrecorded, so official credit went instead to Massachusetts dentist William Morton (1819–1868) for his 1846 public demonstration of an operation using ether performed in a Boston hospital. While Morton administered the gas to the patient through an inhaling device, John C. Warren (1778–1856) removed a neck tumor without the patient feeling any pain. Following this landmark use of ether as an anesthetic, general anesthesia began to be practiced all over the United States and Europe. Chloroform was introduced as a surgical anesthetic by Scottish obstetrician James Young Simpson (1811–1870) in 1847. After first experimenting with ether, Simpson searched for an anesthetic that would make childbirth less painful for women. Although it eased the pain of labor, chloroform had higher risks than those associated with ether. Neither ether nor chloroform are used in surgery today. Anesthesiology was slow to develop as a medical specialty. By the end of the nineteenth century, ether—which was considered safer than chloroform—was administered by persons with little medical experience. Nurses were eventually assigned to this task, becoming the first anesthetists at the turn of the century. As surgical techniques progressed in the twentieth century, there was a corresponding demand for specialists in the area of anesthesia. To meet this need, the American Society of Anesthetists was formed in 1931, followed by the American Board of Anesthesiology in 1937, which certified anesthetists as specialists. In the next 50 years, over 13,000 physicians and nurses were certified as specialists in the field of anesthesiology. Modern anesthesia uses both chemical agents and nondrug methods as preparation for medical procedures. Chemical agents are drugs that can be administered by mouth, by injection into muscle or under the skin with a needle, intravenously (by needle into a vein), or with a gas mask for inhalation. They also come in forms such as creams, gels, or liquids that can be applied or sprayed directly onto the area being treated. Nondrug methods include acupuncture (the insertion of fine needles into the body to relieve pain) and the Lamaze method of natural childbirth, which involves breathing, focusing, and relaxation techniques to limit pain during labor and delivery. General anesthesia. General anesthesia consists of placing the patient in an initial state of unconsciousness, keeping the patient unconscious while surgery is being performed, and bringing the patient back to consciousness after the surgery is over. A drug commonly used to bring about unconsciousness is thiopentone sodium, a drug that acts within 30 seconds after being injected intravenously. The unconscious state is then maintained with other drugs. Inhaled anesthetics (gases or liquids that change readily into gases) are also used to bring about and maintain unconsciousness. These include nitrous oxide, halothane, enflurane, and isoflurane. A combination of barbiturates, nitrous oxide, narcotics (drugs that cause sleep and relieve pain), and muscle relaxants is often used throughout the course of an operation. This is usually safer than giving a very large dose of a single drug that can have serious side effects. During surgery, the anesthesiologist or anesthetist keeps a constant watch on the patient's blood pressure, breathing, and heartbeat, and adjusts the levels of anesthetics being administered as necessary. Local anesthesia. Local anesthesia is accomplished using drugs that temporarily block the sensation of pain in a certain area of the body while the patient remains awake. These drugs act by preventing nerve cells from sending pain messages to the brain. Some local anesthetics are benzocaine, lidocaine, and procaine (Novocain). They are used in dental and surgical procedures, medical examinations, and for relieving minor symptoms such as itching or the pain of toothaches or hemorrhoids. Spinal anesthesia, sometimes called a saddleblock, is achieved by injecting anesthetics with a fine needle into the spine, which numbs the abdomen, lower back and legs. It is sometimes used in such procedures as childbirth and hip and knee surgery. I'm doing an research task for school and this article has been very informational!!! THIS WAS A REAL HELP FOR MY SCHOOL PROJECT. THANKS!! This helped a ton with my school project. It gave a pretty good overall view, Thanks! WOW! this site is absolutely phenomenal. thanks to you, we received an A+ on out science project!!! GO TEAM! This article was gREAT for my research paper! 8th grade can be such a drag when it comes to research papers but this one made it kinda fun. Thanks a bunch! I got an A! ha finally so good information for my project!!! It's been taking me forever to actually find a site that has words that i understand! This has certainly help me with my research for school!! I hope i do well on it! this website is very helpful!!! nineth grade history is hard. This website is very fantastic.It helped me during my research.Ihope others will enjoy. what a very helpfull website !!! it's nice for researchers. i am student of TI college chenab nagar, and i want to know whose made enesthesia medicine. Thank you so much. I have been searching and searching for some good info. for my NHD project that is on general anesthesia. I really appreciate your help. This was easy and very informative. This is AMazing for my history fair project THANKS! omigod i need to do a big project for school that's due tomorow on the greatest inventions and this was such a big help you don't even know!! This was so helpful. Im totally going to nail my invention speech tomorrow! ...thanks alot, was really so informative, thanks alot! Fictional character Haylee Garrett needs a way (using an animal commonly found in the San Francisco Bay Area) that will deaden pain. In the sequel to Haylee and the Traveler's Stone, Haylee will be visited by a Traveler from the future who will require her assistance. While the storyline is fantasy, I like to include little known facts. This article did not answer my specific question, but it was informative and included factoids that I might use elsewhere in my writing. I will also include it in my background research links. I was stressing out but now I'm good , this has been very helpful.